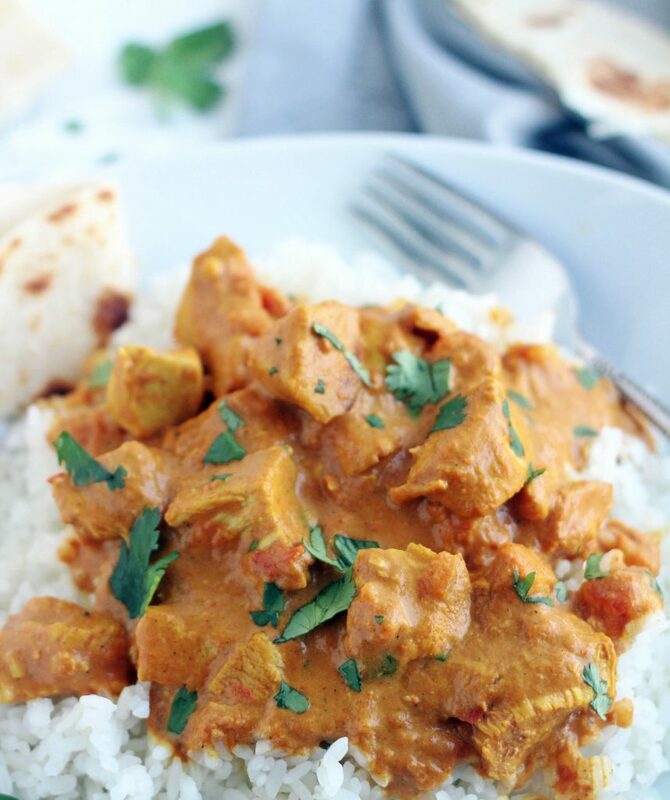 This Instant Pot Butter Chicken is out of this world! The sauce is so creamy and rich you’ll want to drink it. You’d never believe this was made in about 30 minutes! I have been dying to share this recipe with you guys. 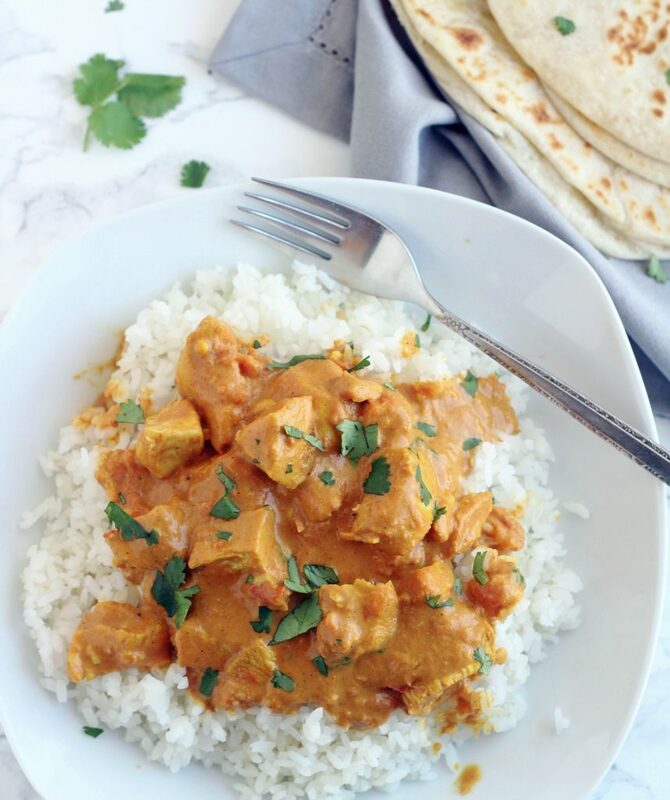 I’ve made this Instant Pot Butter Chicken three times in the last two weeks and I want it again right now! Everything about this is so amazing. . . the smell, the flavor, the simpleness, etc. While I am absolutely in love with this butter chicken, it does require a bit more time because the chicken has to marinate for at least several hours and overnight is even better. Some days remembering to marinate the chicken in time just doesn’t happen, so being able to have delicious butter chicken in 30 minutes is almost as good as chocolate & peanut butter. 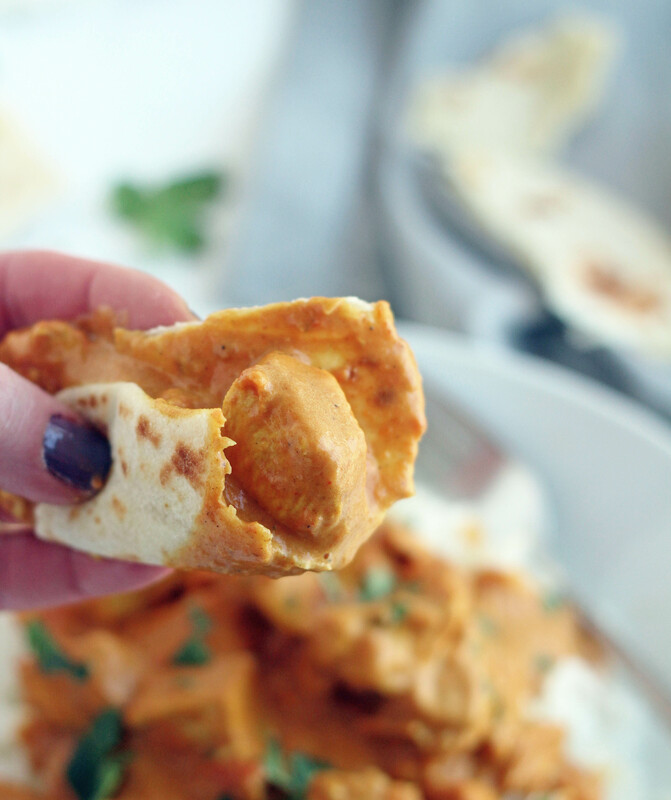 We love Indian food, and this Butter Chicken has completely WOWED us. To be honest, I was surprised I didn’t see any of my boys licking their plate. I make this incredibly delicious flatbread to serve with it because you’ve got to have something to scoop up the delectable sauce with, right? It’s so simple to make and you might have a hard time deciding what you like better, the flatbread or the chicken? I always double the recipe so we can eat some with butter and honey spread all over it. . .it’s to die for! If you don’t have an Instant Pot, I’m sure you could throw everything in your slow cooker and cook on low for 3 to 4 hours or until the chicken is tender and cooked through and then add the butter, cream and remaining garam marsala. I would also put a double layer of paper towels or a piece of tin foil over the top of your slow cooker and then put your lid on. This will keep any condensation from dripping into the chicken, which will cause the sauce to become too runny. You guys, I promise this stuff is phenomenal. I could eat it every day and never get tired of it. Plus, I wouldn’t complain about eating that dang flatbread every day either (it’s soooo good!). Have a great weekend. I’ve got some delicious recipes to share next week that will be perfect for your Easter dinner. Add the crushed tomatoes, garlic, ginger, turmeric, cayenne, paprika, one teaspoon of garam masala, cumin, and salt and chicken pieces to your Instant Pot. Gently stir until chicken is all coated. Lock the lid into place and select "manual" pressure and cook at high pressure for 10 minutes. When the cooking is complete, let the pressure release naturally (should take about 10 minutes). Unlock the lid and remove it and let the chicken sit for 5 to 10 minutes before adding the cream and butter. Add the butter, cream, remaining teaspoon of garam masala, and cilantro. Stir until well incorporated. Serve over rice or with flatbread. The original recipe called for 1 teaspoon of cayenne pepper, I cut it back to 1/2 teaspoon and it had plenty of kick for me. My husband and boys said they'd be fine with it having even more kick, so you decide how much heat you can handle. I would definitely start out with a smaller amount if you're not sure, because you can always taste it and add more in the end. I usually do 3 chicken breasts so there is enough chicken to feed all of us. If you want it to be more "saucy" and less chicken then just use 2 chicken breasts. Make sure your chicken is thawed for this recipe. Any extra moisture from even partially frozen chicken breasts will make the sauce runny. I don't recommend using frozen or partially thawed chicken for this. Any extra bit of moisture from the "frozen/partially thawed" chicken will make this sauce too runny. Is there a way to make this recipe in the crock pot? Hi Tammy! I talked about it in my post. I haven’t made this yet in my slow cooker, but it should work just fine. Would you recommend jasmine rice for this dish? I’ve served it with Jasmine rice and with sticky rice, either one is delicious. Oh my goodness!! YUMMY!! I am so excited to try this recipe! It is on my menu for next week! I can’t wait! Thanks for another fabulous recipe Jodi!! It’s so delicious Mel! You’ll love it! This was absolutely as good as any dish I have had at an Indian food restaurant! I made it in my crockpot. I put everything in but the chopped cilantro and cooked it on low for 3 hours – my chicken was NOT frozen. I would recommend lining your crockpot lid with tin foil so the condensation doesn’t water down the sauce. My husband asked for this to be in a regular in our dinner rotation! Such an easy meal with a power punch result!! Do you think you could use ground ginger instead? Would you use the same amount? Hi Dan. Yes you can substitute ground ginger if you’re in a pinch and don’t have fresh. You will only need about 1/8 teaspoon of dried ginger though. Hope you love this. I made this for my family and some friends for dinner and everyone loved it, little kids included. It was super easy and delicious. Thanks Becca for letting me know you loved this. It’s honestly one of our favorites now. So yummy and so easy in the instant pot! This is a great recipe, similar to the one I use. You might want to try a little plain yoghurt in your sauce. Adds a tang that is unmistakably butter chicken! Thanks for the tip, I’ll have to give it a try.